Since moving to DC have tried to visit a different museum or gallery every thursday. This hasn’t been as consistent as I would have liked. It started off with the best intentions but of course school always seemed to get in the way. Yesterday, however I was able to pick it back up and headed over to the Textile Museum. This museum is in a small space with a few small rooms of exhibition material. Currently they are featuring an exhibition on Contemporary Japanese Fashion. Featuring the works of Yohji Yamamoto, Issey Miyake, Rei Kawakubo, another exhibition Fabrics of Feathers and Steel: the innovation of Nuno runs alongside the fashion exhibit. I don’t know about you but when I think of textiles in a museum, I generally think of some sort of large tapestry of sorts. As you can imagine I was intrigued about this new exhibit. Don’t we tend to leave fashion on the runway. this opens up a new way to look at fashion. Issey Miyake- my favorite designer of the exhibition pieces. 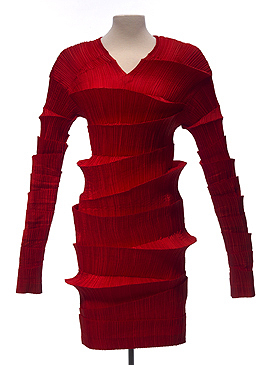 He is known for his pleating, which is is evident in 80% of the pieces. the pleating is intense, giving may garments a crinkly look. The garments produce a sculpted look, truly an artist of the fashion world. An interesting aspect of his garments is that they do not waste any fabric. The epitome of green production. Every piece of the fabric is used, an aspect that comes from traditional Japanese Kimono’s, where the fabric is never cut to fit the body, instead the fabric continues to be wrapped around the body until it has all been used. He has also created a form of knit fabric that allows for all elements of a ensemble to be created, belt, purse, clothing, all of it comes from on piece of fabric and not even the tiniest scrap is wasted. The final designer is Rei Kawakubo- she is by far the most “out there” designer of the trio. Her pieces are not pretty in the conventional sense, and that is the point. She does not create perfectly form fitting as she believes that there is no way to create a perfect human body. She also makes the claim that something does not need to be pretty to be beautiful. While I believe her pieces would be difficult to wear but I think in this case it is more about the concept than the clothing itself. Alongside this is the innovation of Nuno exhibit is a 2 room show of fabrics. hand-designed, creatively non-traditional fabrics. It’s interesting to walk through and see the various ways that fabrics can be created. Overall this is an great exhibit to to check out. It’s not an all day event, which might be good for someone, you could probably even see it all during your lunch break.